Grand openings, great offers, creative workshops and the return of an old friend – the Severn Valley Railway is building up to an exciting and fun-packed February half-term. After six weeks of maintenance and hard work behind the scenes, during which time teams at the railway re-laid track, replaced sleepers, reinforced one of its viaducts, painted a ‘Pannier Tank’ locomotive and cleaned its stations, the SVR will be back with a bang this half-term. 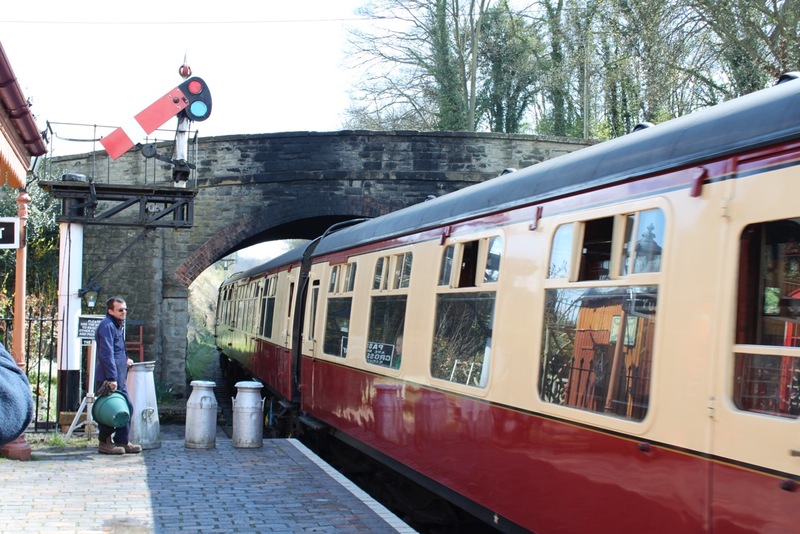 The Railway’s fleet of locomotives will be back in action taking passengers for exciting journeys through the stunning Severn Valley every day from February 16th-24th. This year, the SVR is rolling back the price of its Family Freedom of the Line ticket, meaning up to two adults and up to four children can enjoy unlimited travel along the line during the day, plus free entry to the Engine House Visitor Centre, with free access to a range of fun, half-term activities – all for a reduced price of £49. Creative kids can join LEGO® Master Builder Bricks McGee for fun-filled workshops throughout the day at The Engine House on February 23rd and 24th. There’ll be a chance to Create Local Landmarks at 11am and 2.45pm, Beautiful Gardens at 12.15pm and 4pm and be a Town Planner and build your own metropolis at 1.30pm. Workshops last approximately an hour and are suitable for ages five and over. Places are free with a Freedom of the Line ticket and are available on a first come, first served basis. On display at Kidderminster Station throughout half-term will be the engine that collided with a camel – 8F No. 48773. Visitors can even climb aboard the footplate with Volunteers from The Stanier 8F Locomotive Society to find out all about this fascinating engine with a very colourful history. This half-term will be extra-special for the SVR, with the grand opening of its brand new, much-anticipated refreshment room at Bridgnorth along with a larger, improved overflow carpark. The brand new building, constructed in the style of a Great Western Railway building c1900, is part of an extensive development plan to transform Bridgnorth Station and was funded by the year-long, hugely successful 2016 Share Offer, which smashed its £2.5 million target back in November 2017.
carried out on the SVR and, after a series of successful test runs on the Railway, will pull its first train in more than two decades on Saturday 16th February. Hauling the 10.30am service from Bridgnorth to Kidderminster, the sparkling black locomotive is sure to be an amazing sight. It will also be in service on February 17th, 23rd & 24th. See www.svr.co.uk for more information. Those who’ve ever dreamed of driving a steam train can make this a reality on the morning Introductory Footplate Experience on Saturday 23rd February. Includes chance to drive and fire for 8 miles, bring along four family members or friends to travel in the train and receive a Family ‘Freedom of the Line’ ticket to spend the rest of the day on the railway. This Experience must be pre-booked. Lewis Maddox, the SVR’s events co-ordinator, said: “We really are pulling out all the stops this half-term, with so much to do and see for all ages. Our LEGO®-inspired workshops should be a real hit with kids and adults alike, and we’ll have lots of fun activities going on throughout the week, with the chance to enjoy a great-value day out thanks to our new, reduced family Freedom of the Line fare. “We’re extremely proud of our new Refreshment Room, which provides a fantastic place for visitors to sit back, relax and re-fuel while our trains steam by, and we are delighted to see the return to the rails of 75069, which has been the subject of so much hard work from so many volunteers. We’re sure our visitors will love to see it in action once again.” For more information or to book railway tickets, see www.svr.co.uk or call 01562 757900. 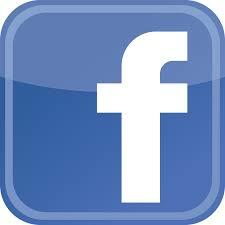 For more news and events, see the Severn Valley Railway Official Site or Families pages on Facebook. The Severn Valley Railway is a full-size standard-gauge railway line, running regular, mainly steam-hauled, passenger trains between Kidderminster in Worcestershire and Bridgnorth in Shropshire, a distance of approximately sixteen miles. A remarkable feature of the Railway is that it is very largely run by unpaid volunteers, with a paid staff of around 70 people responsible for administration and commercial activities, plus regular track and rolling stock maintenance. Through the year, volunteers appear on the Railway to perform many tasks, including repairing and repainting stations, reconstruction of viaducts and bridges, and rebuilding locomotives and rolling stock, not to mention operating the trains. Trains operate most weekends and daily from May to September. The Railway also operates during all local school holidays throughout the year. Kidderminster – Terminus station at the southern end of the line. Most passengers join the Railway here with its easy road transport links and the adjacent connection with the national railway network. The station was built in the mid-1980’s by the SVR. 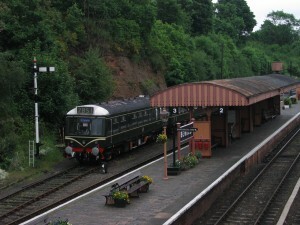 Kidderminster Railway Museum, the Coalyard Miniature Railway (operates at weekends) are also located at this station. Bewdley – Formerly a junction station this is one of the larger stations with it’s three platforms, a great place to just watch the trains go by. Arley – Out in the heart of the Worcestershire countryside this station offers tranquility with easy access to the forest and river walks. A footbridge over the River Severn leads you into Arley village where you will find a cafe, shop and an Arboretum. Hampton Loade – Hampton Loade is a little station in a sleepy hamlet whose peace is tranquility is replaced with snap shots of noise and bustle when the on most days trains pass each other here. Bridgnorth – The terminus at the northern end of the line, Bridgnorth is a popular starting point for visitors from the north and west. The station building is largely original, dating from the opening of the line in 1862 although there have been many changes over the years. The locomotive works is also situated here with viewing of the locomotive yard possible from the station footbridge. The Engine House: The Visitor Centre at Highley is well worth a visit. It houses the SVR’s reserve collection of steam locomotives in an exhibition setting. There is also a very attractive buffet/restaurant with superb views across the railway and the Severn Valley. There is also a gift-shop. Special Events: The Railway arranges a series of special events throughout the year which have broad appeal to adult audiences and family groups. The 1940s Weekends and Family Fun weekends are incredibly popular and the ‘Santa’ services are always a winner with families. Railway enthusiasts are also well catered for with a total of three special weekends, two steam and one diesel, spread throughout the year. 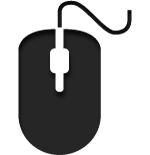 For a brief overview of the history of the line please click here. 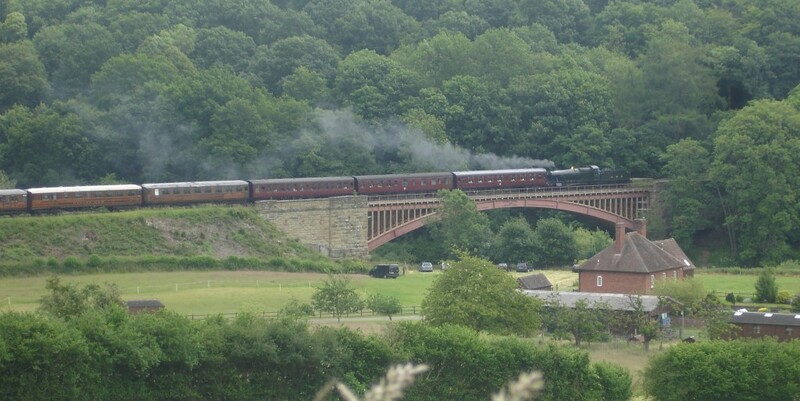 A journey of the Severn Valley Railway between Kidderminster and Bridgnorth takes you through the wonderful Severn Valley. Travelling north from Kidderminster the underlying bedrock switches from Permo-Triassic in age to Carboniferous upon leaving Bewdley. 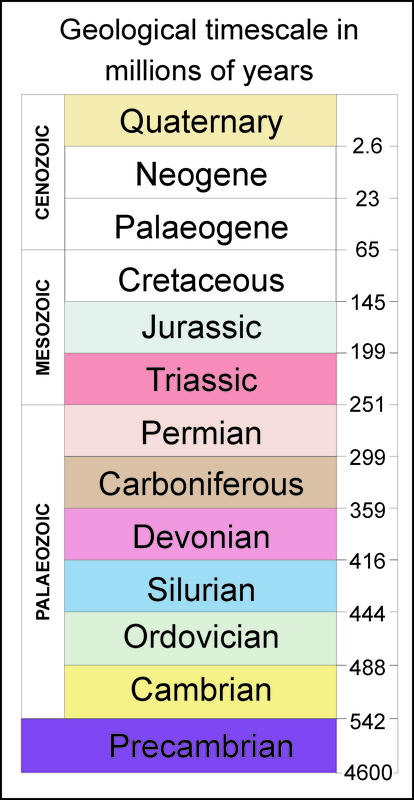 Upon reaching the Bridgnorth area once again the bedrock dates Permian in age. This variety in rock ages and rock types together with the erosive powers of the River Severn and its tributary has created a stunning ‘heart of England’ countryside landscape. The River Severn and later the precursor the Severn Valley Railway carried vast quantities of material along these transport routes, with many materials extracted from the landscape through which the trains now travel. Building Stone (both Carboniferous and Permo-Triassic rocks), millstones, coal, sand and gravel, clay, ironstone and limestone (limited) were all extracted locally. At Bridgnorth station the sandstone cliffs on which ‘High Town’ sits are just a stone throw away. 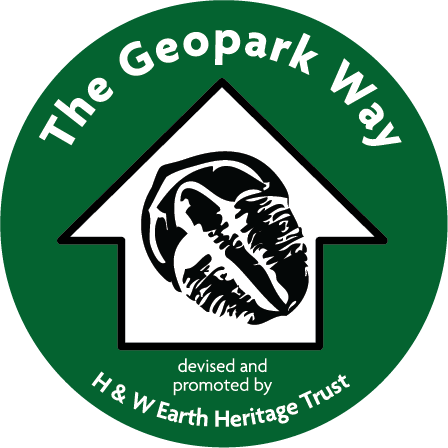 Here you can explore the historical caves and clearly see the dune bedding exhibited in the fossilised dunes of the Permian Bridgnorth Sandstone. Further south, just behind the Engine House in Highley, is Stanley Quarry. This is one of a series of Carboniferous sandstone quarries along this stretch of the valley, where it is believed sandstone was extracted for use in the construction of Worcester Cathedral. 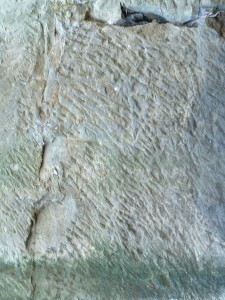 Pick marks along with plug and feather marks are still clearly visible on the rock faces in Stanley Quarry. Acesss to the quarry is by permission of Severn Valley Railway only. At Bewdley Station a group of local volunteers maintain the Permian sandstone rock face alongside the platform, making this exposure a great site at which to view the sedimentary features exhibited. Held throughout the year including Santa Steam specials, Ladies Day, 40’s weekend, Steam Gala and the Ghost Train. Visit their website for details. Severn Valley Railway offers Traineeships and Apprenticeships in heritage railway engineering. Several opportunities are available each year for school-leavers and others with a passion for engineering, and ideally a demonstrable interest in preserved railways or other heritage engineering. The Railway operates daily throughout the summer months, during all local school holidays and most weekends of the year. A detailed calendar showing operating days throughout the year that also indicates the timetable that will be operating on each day by colour – blue, yellow or green can be viewed by clicking here. To download a 2015 calendar please click here. The opening times of Engine House, station refreshments and other facilities vary with the timetable in operation. 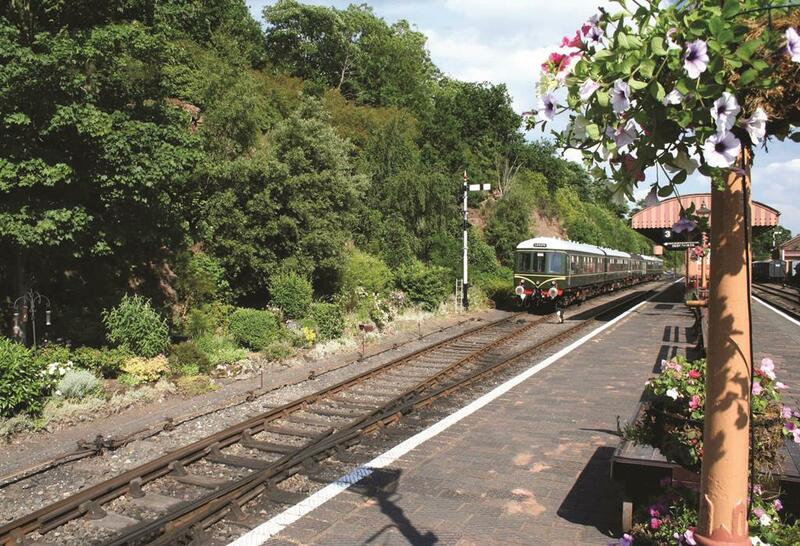 Please check the Severn Valley Railway website for the most up-to-date information.